In 2016, the Bismarck Parks & Recreation District (BPRD) posted a job opening for an operations director. “When the opportunity presented itself for this position, I felt that this transition just seemed right,” he adds. Today, Mayer’s responsibilities include serving on BPRD’s executive team, as well as overseeing the management of the operations division. This comprises parks and open spaces, outdoor recreational complexes, properties that BPRD manages for other entities, all parking lots, 80 miles of trails and land owned and managed by the park district. 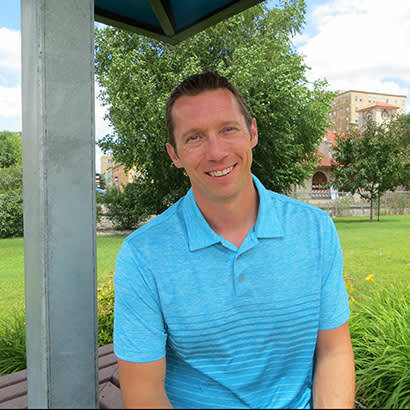 Parks & Recreation magazine recently spoke with Mayer to find out how his park district enlightens the community about conservation, how his background influenced his park and rec role, and an unusual encounter he’s experienced since joining BPRD. Parks & Recreation: As a park district, what are you doing to educate your patrons about the importance of conservation? David Mayer: When the opportunities arise for us to discuss many amenities, outdoor opportunities, parks, trails and green spaces that we have, we take the time to educate our community on the range of properties that BPRD owns and manages — whether it’s riverfront trails and parks, the bluff lands that overlook the river area, our creek-side trail system or our open green spaces. They are all [critical to] educating the public on the importance of open spaces in our community. We are currently working with partner groups to establish native prairie and pollinator gardens in one of our more urban parks, as well as re-establishing and preserving one of our urban forests for the future. So, we take a variety of approaches [and] a lot of it has to deal with creating a built-in environment for people to experience and appreciate what we do as a park district to preserve and conserve these outdoor spaces for the future. P&R: Coming to the park district, do you think your background as a landscape architect gave you a better understanding of conservation? Mayer: I’d like to think that I have a broader perspective on conservation. However, it never ceases to amaze me the sheer knowledge and background of BPRD’s trained park and recreation professionals. They take a holistic approach. Whether it’s the facilities and program side of a park district or the operations staff, there is just a variety of backgrounds and different perspectives. And, I think it works well and plays well together. I feel that I’m another piece of the puzzle to keep us moving the way we are and to be a successful park district. P&R: Tell us one funny or unusual encounter you’ve had working in parks and recreation. Mayer: After accepting the position, I found myself at one of the parks I had designed for the park district for the community to use. Now, years later, working with staff, we were discussing how to maintain the park and talking with our park planner about future things we could do with that park. It was interesting to now have both perspectives on it. And, while everything is interesting here at the park district, I think that was the most surreal thing that I’ve encountered. Vitisia Paynich is a Freelance Writer for Parks & Recreation magazine.